We invite you to Experience Caz by taking a journey through this year’s Viewbook. 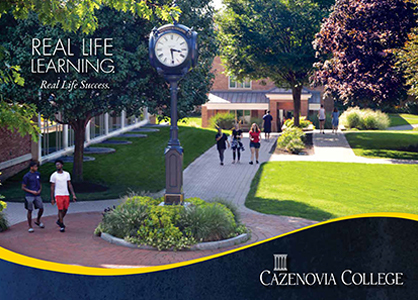 Find out how Cazenovia College can prepare you to go further than you’ve ever dreamed of going. Learn more about the top five reasons students choose Cazenovia College. Most importantly, gain knowledge of the academic and student life offerings, while visualizing yourself on campus as you make your way through photo after photo of our students and all things Cazenovia!